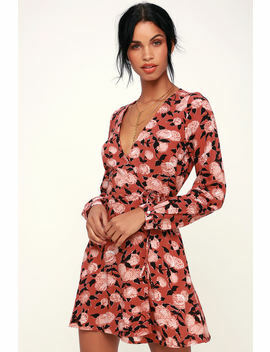 Dress up the Obey Darcey Rusty Rose Floral Print Long Sleeve Wrap Dress for a family gathering, or wear with sneaks for a fun tom-girl vibe! Rusty rose, blush, white, and black floral print creates a bold look across this woven wrap dress, with a V-neckline, long sleeves (with button cuffs), and flaring mini skirt. Adjustable waist tie creates a perfect fit. Logo tag at back.